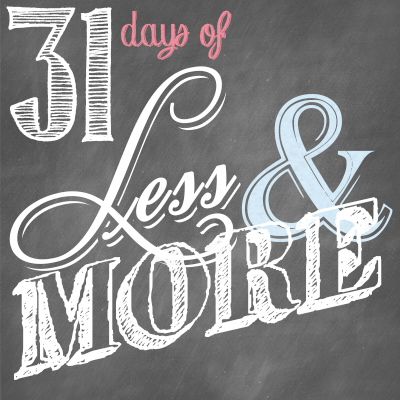 This is Day 10 of our 31 Days of Less & More challenge. To read all the posts in order, start with Day 1, then visit the Overview Page to see the entire series. We usually have no trouble spotting it in others. That friend with the insatiable need for just a little bit more, an ever-bigger slice of the pie. That family member who refuses to share, even just a little. And yet sometimes our vision of greed is limited to that Ebeneezer Scrooge character sitting alone in the corner, counting his piles of money, while those around him starve. It’s not always easy to spot it in ourselves. But greediness comes in many different forms, and our own greed sometimes has nothing to do with money. Am I stingy with my time? Do I choose to spend my precious minutes each day focused on my own pursuits and desires? Am I stingy with my effort? Do I let others do the heavy lifting while I sit back and benefit from the fruit of their labor? Am I stingy with my support? Do I refuse to get involved or participate in a cause because it might require some sacrifice on my part? Am I stingy with my spiritual growth? Do I look at my church in terms of how I can be fed, rather than how I can serve? Do I reserve the best for myself? Do I pick and choose what I want first, then give the leftovers to those around me? Am I stingy with my kindness? Do I cut others down when I could be building them up instead? Am I stingy with my love? Do I place conditions or strings on my friends and family? Am I stingy with my finances? Do I give generously to those in need? Do I forgo future gain for instant gratification? Do I consistently make decisions I will regret later, such as overeating or overspending, because I know it will feel good right now? Do I consistently ask ‘What’s in it for me?’ Am I motivated to act only based on what I can get? The main problem with greed is that it is never satisfied. A greedy heart will always want more. 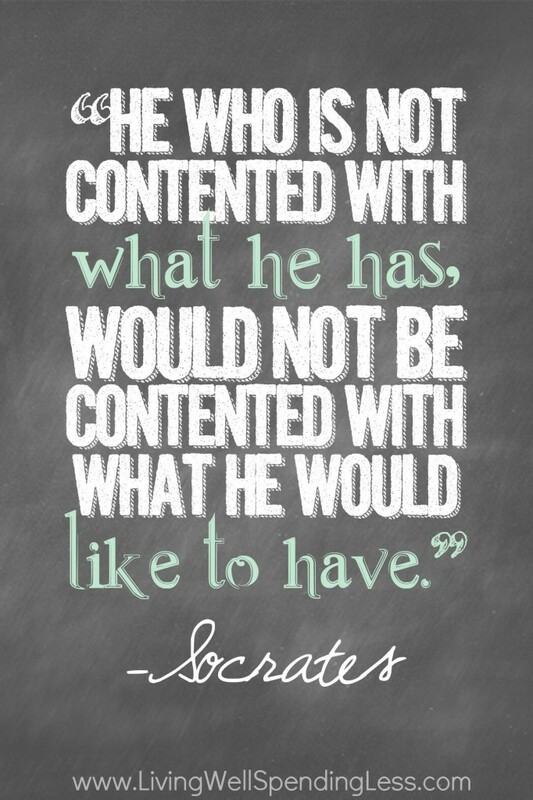 Recognizing the areas in our life where we tend to be greedy, then actively working to change is the first step towards a life of contentment. And just trust me on this one: the more we give, the more we will receive. Be sure to read Edie’s corresponding post, More Generosity. Identify something in your life you are reluctant to share. Is it your time, your resources, your heart, your best effort? What holds you back from giving yourself away to others? Is it fear? Is it self-centeredness? Worry that there won’t be enough left for yourself? Look for ways to share your wealth, your resources, and your time with others. Do it today. Maybe you’ve been wanting to sponsor a child, or maybe you’ve thinking about volunteering your time at a soup kitchen or pregnancy crisis center. You have so much to give and share. Your unique gifts and offerings were meant to be lavished on others. Lavish away, then inspire us with your generous deeds by sharing them in the comments below or on Facebook. Finally, be sure to check out Crystal’s wonderful insight on Less Disappointment/More Wonder from yesterday’s post. Can you identify an area of your life where you are stingy or afraid to share with others? What is something you can do today to be generous with your resources? Today’s post in this serious really hit a nerve in me, in a good way. I usually associate greed with money or material things, but have never thought about it in terms of my time. I feel like I’ve had a light bulb moment this morning, definitely some things to work through in my heart today. Thanks so much for sharing. I’m so glad to hear that Victoria! This subject hits a nerve in me too because there are definitely a few areas in my life where I know I am far too stingy. This is such an important reminder. People often associate greed with money but we can be greedy in many areas of our lives. Thanks for sharing and inspiring me to reflect on this area of my life. Thanks again for another great challenge! Christmas is less than 3 months away! For this challenge I really want to involve the kids.We will start praying for a family in need and set some money aside to pay for presents,food,clothing.Whatever they might need.I did this for Easter for a family when I was a little girl and I still remember it!I remember the excitement on our faces as we hid eggs and knocked on the door.Their squeals and laughter are forever etched in my mind.Until then I have been praying for opportunities to serve if not in my home, someone.I am trying to be more open to it. That sounds like a wonderful plan Kristianne! Thank you so much for sharing! I really put some deep thought into this. I didn’t realize this. Thankyou so much!